One odd thing about Cornwall is that there is no major river. Not that you would get that impression on a circuit of the coast where several estuaries give the impression of serious rivers, particularly those of the Tamar, Fowey, Fal, Helford, Hayle and Camel. But mostly what you are looking at here are rias or drowned valleys. Thanks to the narrowness of the Cornish peninsula, no river flows more than 40 miles to the sea. Our particular favourites are the Fowey for its moorland source, its falls at Draynes Bridge and its lovely estuary; and the Camel for its superb dune-lined estuary and its surfing beach at Polzeath. The one drawback to Cornwall's rivers is that too few paths run for any great distance along them. But they are all worth exploring as far as you are able. 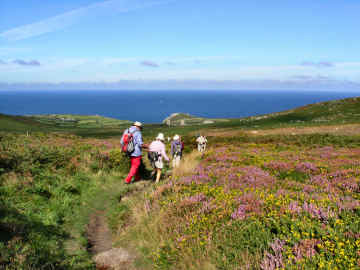 One sees and hears so much about the Cornish coast, its soaring cliffs, its sandy beaches, its sheltered harbours and the wonderful Coast Path, that it is easy to miss the fact that there is lots of glorious scenery and some superb walking inland too. At busy holiday times we tend to head for the moors or the mining trails and get well away from the crowds. I have divided the Inland section into three. The Miscellaneous page includes clay country around St. Austell and some of the great estates; these walks tend to be easy. Rivers flow to both south and north coasts and, although there are no river trails, I include walks in their valleys, again easy walking. West Penwith covers mostly the high moorland to the west of St. Ives and Penzance. I have separate pages for Inland Trails and for Bodmin Moor. Bodmin Moor speaks for itself, high open moorland that rises at its highest to almost 1400 feet; in places the walking tends to be rocky, steep and difficult but the views are sometimes of both coasts. Since few paths are waymarked on the moor, it is wise to carry both large scale map and compass. 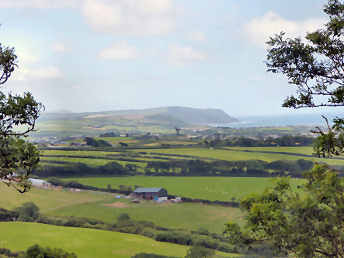 The Inland Trails page includes the Tinners Way, the Zennor Churchway, Saints Way, St. Michael's Way, the Camel Trail, Clay Trails, the Land's End Trail, Mark Camp's enterprising Copper Trail and the Mining Trails. Fortunately, Cornwall Council has an excellent mapping web site, which I find better than the Open Access site ever was. It is easy to use, shows Open Access land, rights of way, path numbers should you wish to report problems, and is zoomable up to large scale. A word of warning on Open Access land. I soon discovered that this may not be quite as straightforward as that. I have encountered barbed wire fences, locked gates and even one gate on Bodmin Moor, leading to access land, that has a 'no walkers' sign on it. And, in West Penwith, where moorland is lower, I have found impenetrable furze and bramble. So don't expect it to be easy. 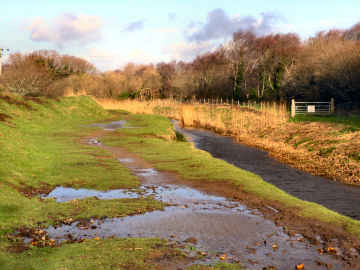 The little River Allen rises near Higher Pendavey, a couple of miles north-east of Delabole, and flows in a general southerly direction until it joins the River Camel at Sladesbridge to the east of Wadebridge. 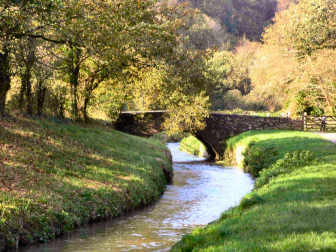 Until 2007 I only knew it from the delightful wooded valley through which it flows alongside the A39 (Atlantic Highway!) from Knightsmill to Kellygreen. On a dull January day I decided to find Castle Killibury, claimed by some as an Arthurian site. As Killibury is only a couple of miles from Wadebridge I was easily able to do the walk from home - south east to Sladesbridge, north east up the Allen Valley to Dinham's Bridge, west by Killibury to Three Hole Cross and Tregorden, and finally south along a track to Ball. Castle Killibury was a disappointmernt, overgrown and quite difficult to distinguish, but the 2¼ mile walk up the Allen Valley was a delight, even in muddy, leafless January. The path follows the river closely, through light woodland, passing a lot along the way: a copper stained stream flowing from an adit, a waterwheel at Hingham Mill, a weir and two clapper bridges (but no mill) at Lemail Mill, and interesting cottages at Dinham's Bridge. This should be a lovely walk in spring and summer. Three Hole Cross, on the A39 a little north of Wadebridge, is an oddity, an intended 4-hole cross on which one hole was never bored right through. Clapper bridge and weir at the former Lemail Mill On OS 106 & 109. Conceived in 1774, the original plan was for a 95 mile canal from Bude to Calstock on the River Tamar. When work finished in 1825 it was a shorter three armed canal, to Tamar Lakes, to Launceston and to Holsworthy. Its essential purpose was to carry sea-sand inland to enrich poor acidic farming soil. Never much of a commercial success, the coming of the railway to Bude in 1898 (now long gone) reduced canal trade drastically and it closed in 1901. Ironically, the railway may be gone but some of the canal is again open. In the 21st century a major regeneration project, at a cost of £3.8 million, has cleared the canal for its 2 miles to Helebridge, restoring the two locks. Beyond Helebridge an incline plane carried goods up to Marhamchurch in tub boats. 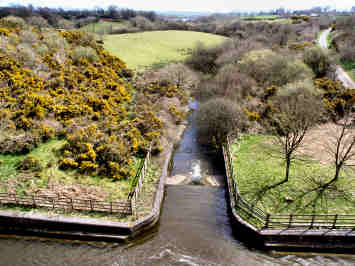 While there is no question of the Marhamchurch inclined plane being restored, the towpath has been improved all the way to the lower inclined plane and the 'Planekeepers Path' has been signed to Hurlibeer Incline and Hobbacott Down, the 'Aqueduct Path' from Lower Tamar Lake to Burmsdon. Since 2003 Jane and I have walked the navigable Bude Canal on many occasions, often as part of a round walk from Bude, on one occasion walking up the incline to Marhamchurch, on another walking a different section starting from Tamar Lakes. In June 2015 I started to try to walk the whole of the 13 mile Tamar Lakes arm. I completed those walkable parts (see above) in Jiuly 2015. Update 2012: When walking the Bude Canal, or doing the round walk associated with it, we always used to enjoy the excellent Woodlands Tea Garden at the Helebridge end of the canal. That closed but the Proudfoot family, owners of the up-market Whalesbridge Farm holiday complex, have now opened an excellent café/bistro named The Weir. We have lunched there a couple of times and enjoyed excellent value good food. We recommend it with the reservation that at busy times service can be very slow. Update August 2012: There is another café near the canal. If you are walking the cycle route on the east side of the canal and the River Neet, only about half-a-mile out of Bude you will find River Life Café next to Bude Cycle Hire at Pethericks Mill; we have some reserations; also on the site is The Bank, a tapas bar. Another Round Walk including the cycle route and the canal tow-path. At the end of June 2015I decided to start walking the derelict and long abandoned Bude Canal from one of it's origins at Lower Tamar Lake (the others were Holsworthy and Launceston). On my first walk I only did the first two miles to the lane to Dexbere. I excuse myself for earlier that day spending much longer at the wonderful St. Swithin's Church, Launcells than I had originally intended. The walking was as easy as you might expect on a canal towpath and was really quite colourful with wild flowers, particularly buttercups, cowslips, pink cow parsley and others. 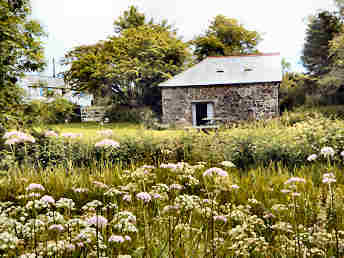 The Bude Canal and Harbour Society clearly makes some effort to keep this remote part of the canal in accessible order; the grass had been mown and overhanging branches lopped. The canal is in such a derelict state that it is quite difficult to spot any detail, but I am reasonably sure I noticed the remains of two locks. I was pleased that the little warehouse at Virworthy Wharf had a small exhibition in it. And I was also pleased to see that some effort has been made to provide interest: granite posts with plaques of a dragonfly, an otter and a canal barge, and waymark posts topped with a wooden representation of a tub boat. My next walk here will take me to Burmsdon. After that there will be a gap and I shall have to start again at Thurlibeer Incline Plane. I found there was a distance discrepancy: my GPS read 2.04 miles, Bude Canal Society signs say 2½ miles, my map wheel suggests jsut over 2 miles..
Logistically this is a bit of a difficult one though, had I realised it, not quite as difficult as I thought. Had I realised that there is a parking area by the Vealand Nature Reserve, I would have considered parking there, though that would have meant an out-and-back in two directions. Since there is really nowhere to park on the lane from Broomhill Cross to Dexbeer, I decided to park south of Burmsdon Bridge in a large lay-by a little way south of Kingford Mill. I was probably trespassing to walk the track to Burmsdon Bridge, which is the private property of Burmsdon Farm but, when I found a gap in a fence on the bridge, with a sliding piece of wood to allow one through, I decided that, despite a notice encountered a hundred or so yards along the canal tow-path, the Symonds family are prepared to accept that as a means of access, so I hope they will forgive me my trespass. So I walked the canal in reverse direction, coming off at the lane from Broomhill Cross to Dexbeer in order to take quiet lanes back to my start point. Interest along this section includes several sections of aqueduct, good barns at Puckland Farm, a wooden stop-lock a little further on, Dunsford and Vealand Natures Reserves, the beginning of the former Holsworthy Arm, surprisingly in water, and Vealand Incline Plane which raised the tub-boats some 60 feet. To contact the Symonds of Burmsdon Farm for permission to access the canal from their property, telephone 01288 381238. This was my final walked section of the walkable Bude Canal, undertaken in mid July 2015. Although there is car parking at both ends, I had little choice but to do it as an out and back. I decided to start from the car park at Helebridge, walk to where the path comes out on the Stratton to Holsworthy road at SS 24493/05043, then walk back on the same route to Helebridge. My reason for choosing to do do it this way was that I would climb the Hurlibeer (or Hobbacott) Incline during the first half of the walk rather than at the end of the second half. I am sure you will understand why when I report that the incline rises 235 feet in 935 feet walked, a steeper than 1 in 4 climb. I found the ascent tough going but worth it for the great views on the way up (see photo) and from the top, So now I have climbed two incline planes, Marhamchurch and Hurlibeer; a third, which I think is between Burmsdon and Cross Farm, is on private land, inaccessible and probably ploughed out. Again there is a distance discrepancy. I made it about 2½ miles from the Hobbacott Farm turning to Helebridge; the wooden footpath sign there shows 2½ miles to Marhamchurch. My headline distance takes account of the discrepancy. "Planekeeper's Path" signage is mostly clear enough but it is a good idea to have the PP leaflet with you for the finer detail. There is little doubt that this final short section of the Bude Canal is the most scenic. It is also far and away the easiest to walk, the towpath having long been cleared and now surfaced with tarmac. One can understand why the Bude Canal and Harbour Society has chosen to tarmac the towpath. It does after all ensure that it is entirely wheelchair friendly. It also, unfortunately, makes it less comfortable to walk on than the previous more yielding surface. There is an alternative route from Helebridge to Bude; this is a designated cycle route - though little used by cyclists - which runs on the east side of the River Neet and adds about 1/3 mile to the distance. We remember the canal when final restoration of the Helebridge to the Sea Lock section was yet to start, Rodd's Bridge Lock and Whalesborough Lock were yet to be restored and many places were a tangle of tall reeds and rushes. The Society has certainly made a wonderful job of restoration; it is just a shame that the low clearance below the road bridge in Bude means that little larger than canoes can use these two miles of canal. We have long enjoyed walking this short section of the canal as part of two quite different round walks. 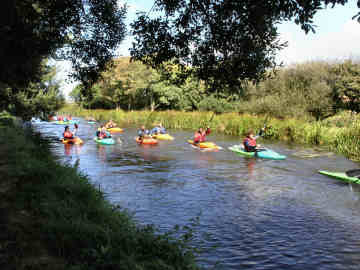 One uses the cycle route from Helebridge to Bude, returning along the canal. The other first follows the canal, then uses the Coast Path to just short of Widemouth Bay and returns across fields. Both are easy walking. One thinks of the Camel as a river of Bodmin Moor. Indeed you do encounter it on parts of the northern moor, but not on the heights and it cannot be said, in any way, to drain the moor, except that it is joined near Poley's Bridge by the De Lank River which really does drain a part of the moor. The Camel itself rises on the very northern extremities of the moor near Davidstow. On its way to the town to which it gave its name, Camelford, it passes through Slaughterbridge. The owners of Worthyvale Manor there like to claim it as an Arthurian site - indeed the place where Modred slew Arthur at the Battle of Camlaan - but the basis of their claim, an inscribed stone by the river, never recorded any claim to commemorate Arthur's death. 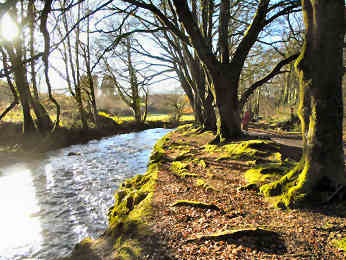 After Camelford the river runs through farmland and light woodland until it reaches Wenford Bridge. 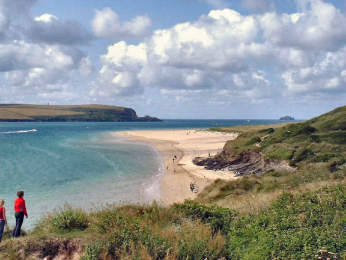 Here a trail joins it, the Camel Trail, as it continues through woodland all the way to Wadebridge, before the countryside opens out alongside the Camel Estuary to Padstow and beyond for the river to enter the Atlantic between Stepper Point and Pentire Point. This is our favourite section of the Camel, the broad estuary beyond Padstow (best views from that side) where it is now followed by the Coast Path with views across the water to Rock, sand dunes, Brea Hill and Daymer Bay. 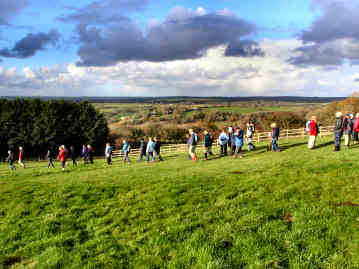 We don't usually walk with groups - though many years ago in London we joined the Independent Ramblers and did quite a lot of Chilterns walking. Nowadays Jane's walking is mostly of the dog variety and, except when sisters or friends stay with us, I usually prefer solitary walking. However, in November 2006 we were delighted that we made an exception and joined the Camel Group for their AGM Day. A full day consisted of a walk, lunch at the Old Inn at St. Breward, a presentation to Anthony Hawkey, founder of the Cornwall Ramblers, and a fascinating presentation by Mark Camp about his Copper Trail. As non-members we didn't attend the AGM itself. Jane, my sister Frances and I had a great day. The walk was an easy one - though with an abundance of stiles - down into the Camel valley by way of Lower and Higher Lank and Coombe Mill, then back up to St. Breward by way of Fellover (but nobody did). Less than four miles but seeming more like five taking into account terrain and stiles. Although I have done a vast amount of walking on Bodmin Moor, and this walk is just within the confines of the moor, I hadn't been on most of these paths before; it was most enjoyable. Highlights for me were two clapper bridges and the remains of a quarry tramway bridge. The walk in detail, with full route directions. Looking across the mouth of the River Tamar at Plymouth you would think you were seeing a great river; not so. Looking across the mouth of the River Fal from St. Mawes, you would think you were seeing an even greater river. At this point, where the estuary is known as Carrick Roads, the river is a mile across and that width stretches for four miles inland. Appearances mislead. What you are really looking at is a drowned valley (ria) with a lot of minor rivers flowing into it. The Fal itself, depending on which authority you believe, is a mere 19 or 23 miles in length. It rises on Goss Moor, north of St. Dennis and winds its way through china clay country, even at Grampound Road and Tregony (it was once navigable to here) still being little more than a stream. The drowned valley begins at Ruan Lanihorne, water at high tide, mud at low. It's only when the Truro River joins, just north of Trelissick Garden, that it becomes a serious river, some 200 yards wide and deep enough for out of commission ships to anchor. Soon after, at Turnaware Point, it widens out to a mile or more. This is now serious sailing country with yacht clubs and anchorages by most of the creeks. Where the Penryn River joins at Falmouth there are important docks. 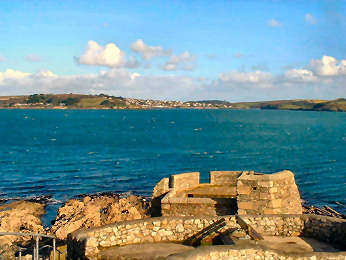 Tudor and later forts - Pendennis, St. Mawes and St. Anthony - guard the mouth of the river. The only truly satisfactory way to see the maze of creeks around the River Fal is slowly from a small boat on a reasonably high tide. My way, still fairly satisfying, was on foot in July 2007. I parked at Trelissick Garden and took a walk that allowed me to explore Lamouth Creek and Cowlands Creek and took me eventually - by way of Old Kea - to the Truro River at its junction with the Tresillian River. On my way to park at Trelissick I had already parked in charming Feock village to walk to Loe Beach (seasonal café) and Pill Creek on either side of the village. My route from Trelissick - on OS 105 - took me down a well made bridleway through Delabole Wood, briefly on a road towards Cowlands, then along a former wagon road to Roundwood Quay where Lamouth and Cowlands Creeks join the Fal. 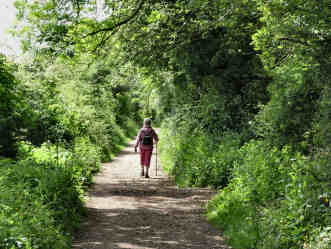 Back along the wagon road and right to Cowlands where I followed a creekside path to Coombe. Next a woodland path to Halwyn and a mile of quiet lane before turning east to Trevean and north across fields to St. Kea. I then continued north to the confluence of the Truro and Tresillian rivers for an unusual view of Malpas. Returning I followed obvious lanes past Cowlands then detoured east through National Trust woods to revisit Roundwood Quay. A lovely walk with an abundance of beautiful tranquil creek scenery. The Tamar is Cornwall's major river but, forming as it does the boundary with Devon (England if you prefer), it is only half Cornwall's. So I prefer to think of the Fowey, which drains Bodmin Moor, as our most important. You could scarcely call it a major river. It is only 30 or so miles long but that is hardly surprising in a county only around 40 miles at its very widest. The Fowey rises on Bodmin Moor, on the eastern slopes of High Moor, although this is confused by the existence of Fowey Well on the eastern slope of nearby Brown Willy - but then Bodmin Moor was originally Fowey Moor. 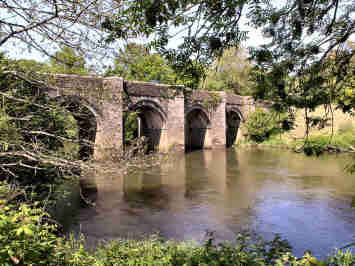 The Fowey runs more or less south to reach Draynes Bridge, then west to the Lanhydrock Estate and south past Norman Restormel Castle and through Lostwithiel to reach the sea at Fowey. In the middle ages the river was fully navigable to Lostwithiel, which was a major tin-exporting port. But mining debris silted the river and now the only port is at Fowey, from which china clay is shipped. 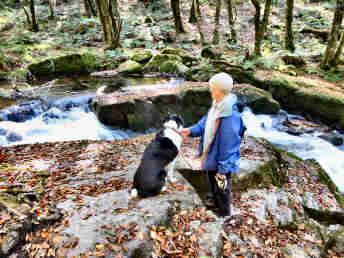 The most scenic feature along the Fowey's course is Golitha Falls at Draynes Bridge. It is just a shame that, apart from there, the only paths along it are on the Lanhydrock Estate, at St. Winnow and at Golant; not that anglers, who fish the Fowey for salmon and sea trout, will mind that. Although this is one of the few places where you can walk along the Fowey River, at least it is both the prettiest and the most exciting. Park in the large free car park, signed just off the road from Doublebois to Minions, and walk the half-mile along the river to the falls. The way is through lovely beech woodland, at first on a firm path but then on less even ground and, at one point, along an old mine leat. Don't expect one great waterfall. Instead, for a couple of hundred yards, the river tumbles over separate cataracts until it has fallen some 100 feet. Thanks to the moist micro-climate, the ground and rocks are rich with ferns, lichens and mosses. A word of warning - this is dog-walking territory though owners are generally well-behaved. More Golitha Falls. Towards the end of October 2016 we were listening to Lawrence Reed's lunchtime programme on Radio Cornwall and heard him talking to Debbie, the enterprising wife of a local farmer. 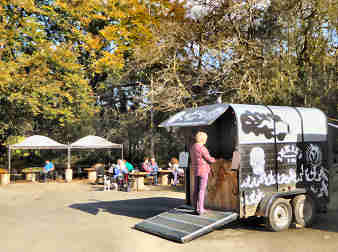 She has taken a 25 year lease on the toilets at Draynes Bridge, location of the Golitha Falls car park (which means they will stay open despite Cornwall Council's swingeing cuts) and on the adjacent site on which she has a converted horse box, serving delicious freshly cooked food, described as "pit-smoked barbecue". The next fine day we headed to Draynes Bridge with Meg the Collie. 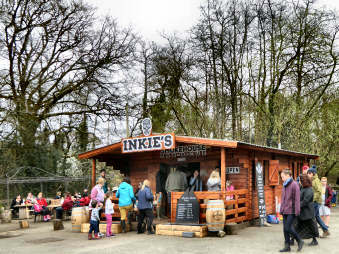 We had a lovely walk in the beech woods by the Fowey River and then lunched at Inkie's. I had a superb bacon butty (their own pigs) and Jane had a lovely mushroom concoction in a soft roll. We both had freshly made coffee. A successful Crowdfunding exercise enabled Debbie to open her new permanent cabin in 2017. It has a serving counter, with good ice cream, a full-blooded kitchen with oven and griddle, a separate utility room, and seating at tables and on saddles at a bar. The food is as good as ever with an enterprising and comprehensive menu. Strongly recommended.. Inkie's web site. Beware, it's a bit awkward to navigate. INKY'S: Daily excluding Mon and Tue. The horse box has been replaced by a new log cabin. More and new photo to follow. It is surprisingly difficult to find out anything about the Hayle River. Usually I rely on the Cornish Rivers Project as a source of information but, this time, nothing. Looking at the Ordnance Survey map, it seems to me that it rises at Trelabnas, about 1½ south-south-west of Crowan (near Praze-an-Beeble). It then flows westwards, passing through the northern edge of the Godolphin estate on its way to Tregembo, where it turns north-west on its way through the villages of Relubbus and St. Erth and on to Lelant Saltings, where the estuary begins, joining the Atlantic in St. Ives Bay. All seem to agree that its length is about 12 miles. Its first recorded name is heylpenford though the penford bit sounds English. There are two meanings suggested for heyl - estuary or fordable river. I am now familiar with three parts of the Hayle. I have walked along it for a little way on the Godolphin estate, from Trannack Mill to St. Erth [doing Leedstown to St. Erth on the Land's End Trail], and on both banks of the estuary. The only other part that appears walkable is a short section south of Trannack Mill as far Relubbus. Between Trannack Mill and St. Erth a wide grassy bridleway follows the west bank of the little river. 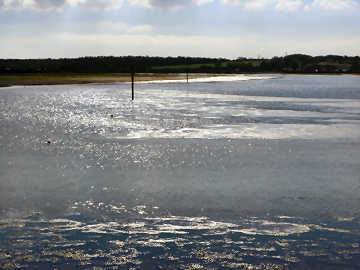 Here the Hayle has been dredged, its banks cleared and revetted in places. A delightful walk with parking close to the charming church in St. Erth village. The name Hayle is from the Cornish word heyl, which simply means estuary or fordable river. That makes sense because it rises only some 12 miles away from its tidal limit at St. Erth, while the estuary is relatively vast. For so tiny a river the Hayle has considerable historic importance. Since around 2000 BC it was vital as a trans-shipment point, allowing vessels to avoid the incredibly dangerous waters off Lands End. They would sail up to St. Erth and offload goods there for portage to Marazion and St. Michael's Mount on the south coast. The same was as true of people as of goods. Ireland, Wales, Cornwall and Britanny were linked by their common Celtic roots and, in the early Christian era in the first few centuries AD, missionaries and itinerant monks would pass through Hayle and Marazion on their way. The great estuary, far less silted up than now, was the reason why Harveys, the great engineers, flourished at Hayle. Nowadays, with Harveys and the Cornish Copper Company long gone, the navigable channel is so narrow and shallow that only small fishing boats use the harbour. The inland part of the estuary is now a nature reserve where wigeon, teal, shelduck, dunlins, curlews and grey plover over-winter. It is marked on the map as the Helford River, and that's what everyone calls it, but really it is just a ria, a drowned valley. 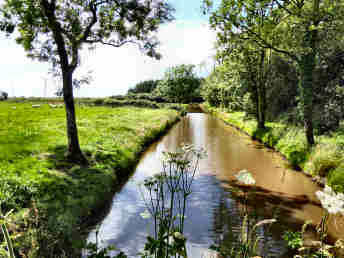 A few unimpressive un-named streams debouch into it in the course of its six miles from the sea to the tidal limit at Gweek, the longest, of about three miles, looks to rise just to the east of Helston. 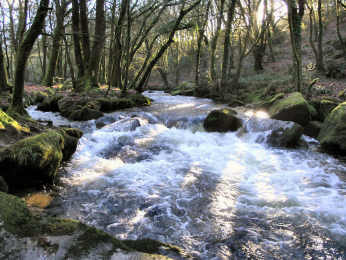 More striking are the many creeks that these streams enter the Helford River by. Best known is the sombre Frenchman's Creek, made famous by Daphne Du Maurier. Most attractive is Porthnavas Creek, filled with small boats, lined with expensive second homes and location of the Duchy Oyster Fishery. 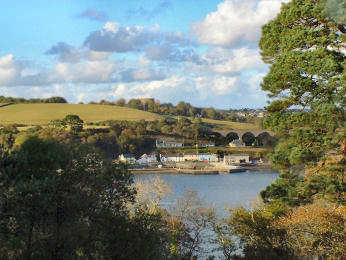 Helford village, too, is second home and boating territory. Gweek, at the tidal limit, has a boatyard, houseboats and an engineering works - and is home to the renowned Cornish Seal Sanctuary, now sadly part of the multinational Merlin Entertainments Group. The best way to enjoy the Helford River is undoubtedly from a small boat. As a walker, it saddens me that there is so little foot access - really only one bank of Frenchman's Creek and the coast path as far as Helford Passage on the north bank, Helford Village on the south. 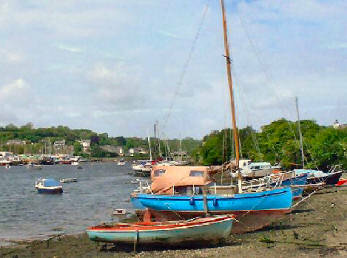 The two are linked by a summer ferry and each has a pub, the Shipwright's in Helford, the Ferryboat in Helford Passage. On the north bank several valley gardens run down to the river - Glendurgan, Trebah, Meudon Hotel's garden and Carwinion, where, exiting at the bottom, you can continue down to Porth Saxon. It's difficult to know how to classify this walk, which I first did on a soaking wet day in late July 2006. It's right in the centre of Bodmin Moor but there is no moorland in the walk. 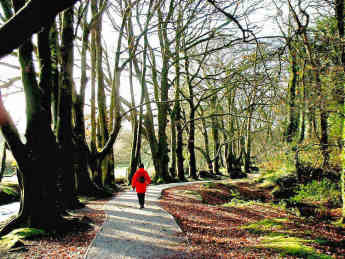 It is described as a trail but is only a relatively short round walk. So I shall call it a river walk since you encounter the River Inny several times on its loop, and meet up with Penpont Water, too. It's a pleasant, largely farmland walk, easy except that its 60 plus stiles - many 6 feet high - make it feel more like a 10 mile walk. It can be extended to 8 miles, adding a 2 mile loop from Trethinna to Trerithick, by way of Polyphant, mostly across fields. There should be a trail leaflet in the village shop in Altarnun, where the walk starts, but they were out of print (I think they always are) so I needed OS Explorer 109 as there are no trail signs out of Altarnun or for the first mile. Thereafter trail signs are confusing and often inconsistent. All that may make it sound like not much of a walk but, in fact, it's worth doing and I enjoyed it. Notable along the way are Laneast Church, the bridge and former mill at Gimblett's Mill and the former manor of Trethinna. Altarnun itself is charming. There are no refreshments along the way, the nearest hostelry is the King's Head at Five Lanes where I have enjoyed excellent beef and onion baguettes on a couiple of occasions. For my last walk in November 2006 I abandoned the rigours of Bodmin Moor and settled instead for a fairly level walk for which I could use the bus from Wadebridge to St. Columb. I did a straightforward out and back walk, following the course of the little River Menalhyl from St. Columb to Mawgan Porth. On a previous occasion Jane and I had walked from the porth to St. Mawgan and back so I knew that part to be pleasant. I had expected less of the other part but enjoyed that, too. The walk was about 11 miles but walking to and from buses added a couple more miles. My walk started from near St. Columb church and along Victoria Street till it became Halveor Lane. I followed the lane - no traffic - to Little Halveor farm and entered the Carnanton Estate. Carnanton is a sporting estate and thousands of noisy pheasant were killing time waiting for the guns to kill them. The track through the woods to St. Mawgan is so well made I think it must be a former coach road. Pleasant woodland, the Menalhyl always close-by and an ancient park wall following it. In St. Mawgan I crossed the river and continued to Mawgan Porth on the far side. I had coffee at the Merrymoor on the porth and enjoyed good soup for lunch in the attractive Falcon in St. Mawgan on the way back. Half-a-dozen tiny streams rise on the land below Trelow and St. Breock Downs, coverging near Melingey, just before the tiny village of Little Petherick. There the nameless stream becomes tidal as Little Petherick Creek. It flows for a couple more miles before joining the estuarine River Camel. 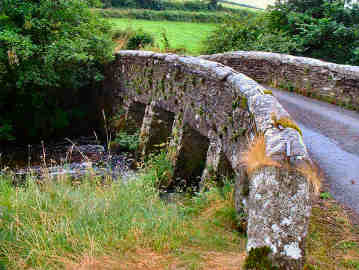 We have crossed the narrow packhorse bridge at Little Petherick many times on our way to Padstow in the car. In January 2007, still recovering from a nasty cold, I decided on a short easy walk there. I had intended to follow Jarrold Pathfinder walk 19 (about 6 miles), which follows the west bank of the creek, then the Camel Trail, and return by St. Issey. Something I spotted along the way changed my mind - and route. The first part of the walk - to the Camel Trail at Padstow - was familiar as the beginning of the Saints Way, perfectly waymarked, through woodland and up over Denis Hill to the edge of Padstow. I then crossed the Girder Bridge on the Camel Trail and turned right up a track to attractive Tregonce, then over fields back to the creek. There, at Sea Mills, I found the remains of a tide mill, the pound silted up but part of the sluice and wheel pit still in place. From there the path is on the foreshore (very muddy for some way) then through new woodland and over fields back to Little Petherick. I had wanted to revisit the Luxulyan (pronounced Luxilian) Valley ever since first encountering it while walking the Saints Way in 2006. Then I had loved the glorious beech woodland. I had also been impressed by the Treffry Viaduct and had wanted to see more of what had to be associated with it. There is some parking near the viaduct but when Jane and I walked there in early June 2008 we parked at the bottom of the valley at Pont's Mill, where parking is ample and much used by dog walkers. This is now a lovely peaceful valley and, except for some stone quarries, would have been before local landowner and industrialist Joseph Treffry (of Place in Fowey) decided to construct tramways to carry mineral ores and china clay to his new harbour at Par. The vast viaduct - 650 feet long and 100 feet high - carried both his horse-drawn tramway and a leat to power the 34 foot water wheel that operated the steep Carmears incline. The leat continued on south to power Fowey Consols mine. The tramway continued north to Bugle. Treffry planned to continue to his new harbour on the north coast at Newquay but that had to wait until the 1870s when a consortium acquired the route for their Par to Newquay railway, still operating as a branch line. Treffry's viaduct towers empty over the modern railway but still holds water in its leat. UPDATE APRIL 2013: Since I was last in the Luxulyan Valley in March 2012, devising an alternative route for part of the Saints Way, work has been completed on the Carmears Tramway. Running from the Treffry Viaduct to the Wheeelpit at the head of the incline, vegetation and mud have been cleared and more of the granite setts, and some sections of rail, have been exposed. Work has also been carried out on the viaduct itself, removing vegetation and restoring the leat. 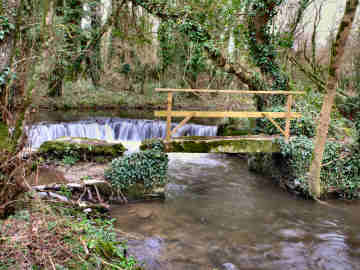 A RECOMMENDED WALK: From the Pont’s Mill car park at 07298/56156, accessed from the A390 just E of Tywardreath Highway, a track heads in a generally NW direction through beech woodland. On the way it passes the former Mid-Cornwall China Clay Dries and eventually passes under the Treffry Viaduct. You get up to the viaduct by steep paths and steps on the hillside to your right (E). To return, starting from the south-eastern end of the viaduct, head overall SE on the old Carmears Tramway, passing the great Carmears Wheelpit and continuing fairly steeply down the former Carmears Incline. The River Lynher rises on the north-eastern fringes of Bodmin Moor and meanders for some 22 miles (according to the Cornwall Rivers Project - I would have thought it longer) eventually joining the River Tamar within sight of Brunel's famous Royal Albert Bridge. Though rising in granite country its course takes in slate, limestone and grit as well. Much of its catchment area is dairy farmland with some beef, some sheep and a little arable. It is very much a fisherman's river with salmon, sea trout and brown trout - though the salmon fishing has deteriorated in recent years. It's confluence with the Tamar, known as the Hamoaze, is a designated Site of Special Scientific Interest and supports otters, kingfishers, dippers, avocets and black tailed godwits. Information gleaned from the Cornwall Rivers Project website. A little disappointingly there is hardly any part of the river that you can walk along, though I encounter it often enough on walks - for instance from North Hill to Trewortha Tor and on a section of the Land's End Trail. My favourite spots along the river include Starabridge and the wobbly bridge (since replaced) at North Hill. But my favourite view of the Lynher is looking across to Antony Passage (left) from Antony Woodland Garden. Update 2014: After 50 years, the ferry that used to run from Restronguet Point to the Pandora Inn, has at last been reinstated. It is operated by the King Harry Ferry Company and runs in July and August. I did this walk just before Christmas 2006 and really only chose it as it gave me the opportunity to call into Truro on the way home to do some last minute Christmas shopping. 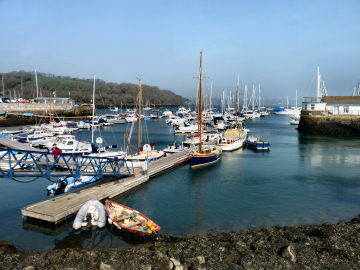 I parked at Mylor Harbour, at the mouth of Mylor Creek, followed the creek to Mylor Bridge, headed inland on a fairly busy road to Penryn, followed the Penryn River to Flushing and finally headed through the Trefusis Estate, on the edge of Carrick Roads, back to Mylor Harbour. It proved to be a pleasant and easy seven miles or so but, in gloomy weather and at fairly low tide, it was much less interesting than it might be under more summery conditions. Jane remembers Mylor Harbour (at Mylor Churchtown) as having little more than a few small boats. Now it boasts a marina, a yacht club, a seafood restaurant, a bar, a café and a substantial boat lift. It is clearly a wealthy place to match the other wealthy places along these creeks off the Fal. Flushing is one of these with some lovely restored cottages, some large houses, a couple of pubs and an admired restaurant, the Sticky Prawn. Its odd name was given by the Dutch engineers from Vlissingen (which we called Flushing) who built Falmouth's harbours. Oddly there is another Flushing not far away on Gillan Creek. At the end of October 2005, on a bright sunny Sunday, Jane and I were looking for a shortish level walk within half-an-hour or so of home and with a decent pub along the way for lunch. We decided to try a section of cycle trail (part of National Cycle Network route 3) that runs from the south side of St. Austell to the little former harbour village of Pentewan. I already knew Pentewan from a coast path walk I had taken from Mevagissey to Black Head and was sure Jane would enjoy it. We could have parked close to the St. Austell by-pass and walked about four miles each way. Instead we chose to use the small car park just south of Levalsa Meor, walk just a mile-and-a-half each way and allow time to explore Pentewan and walk along the beach. 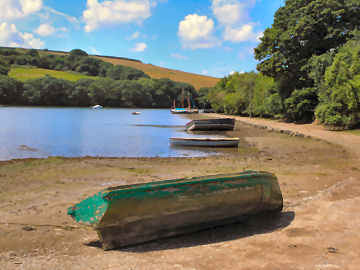 A surprisingly varied short walk takes in the canalised St. Austell River (also known as the White River from the china clay spoil, a nature reserve in Kingswood, and a section of former mineral tramway. Some woodland is more like swamp, trees grow at crazy angles out of dark pools. We lunched at the Ship Inn in Pentewan village and enjoyed excellent hot filled baguettes, bacon and mushroom for me, egg and mushroom for Jane. Now (2006) the trail links with the clay trails at Wheal Martyn. There is also a coastal round walk using the southern end of the trail. Update June 2008. I learned from surveyor and map maker, the late Ernie Biddle that there are now off-road links to Heligan Garden and Mevagissey. If you want to walk from Pentewan to Wheal Martyn, you will have to negotiate a mile or so on streets through St. Austell. 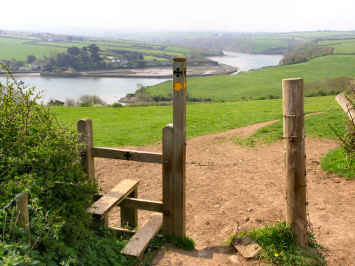 The Tamar forms a natural boundary with Devon, rising in the far north-east of the county, to the north of Bude, winding its way south to Plymouth Sound, tidal for its last dozen miles. 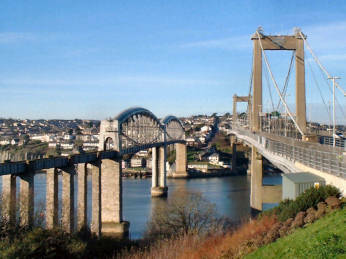 Although Brunel built his great rail bridge in 1859, until 1961 the southern road crossing was the medieval 'New Bridge' at Gunnislake and crossing from Plymouth was only by Torpoint Ferry. Once the Tamar Valley was a major daffodil growing area; now their descendants flourish on the National Trust's lovely Cotehele estate. Up-river the pretty village of Calstock has a railroad viaduct over the river, the enjoyable Tamar Inn and a seasonal riverside cafe. The Bude Canal is a real oddity. When you think of canals, you first think of the Industrial Revolution and of all the canals that were built in the 18th and 19th centuries in the English industrial north and midlands to carry the raw materials and the heavy goods of industry. In hilly Cornwall horse-drawn tramways served the tin and copper mines. Cornwall's major canal was a very different affair. 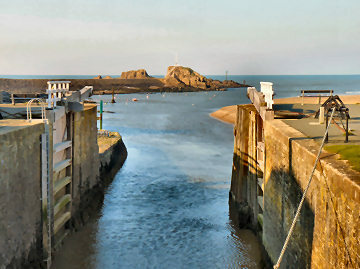 The Bude Canal opened in 1823 to serve agriculture, mainly to carry lime-rich sea-sand inland from Bude to improve the very acidic soil of northeast Cornwall and northwest Devon. Intended to link with the Tamar, it never did and closed in 1891, having struggled to make a profit. One arm ran south to Launceston, one east past Holsworthy, and water was sourced from a reservoir now known as Lower Tamar Lake. 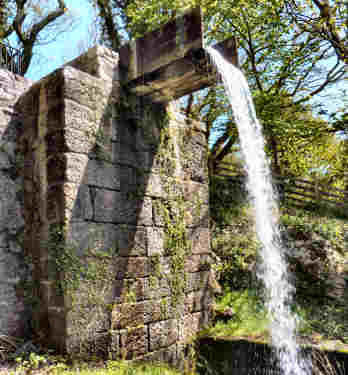 After the canal was abandoned an upper lake was constructed and the two provide much of North Cornwall's water. Some restoration has taken place; 2 miles from Helebridge to Bude - including locks - are restored and navigable. Elsewhere, land has been sold and inclined planes are long gone. 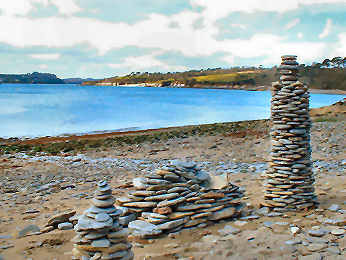 In April 2006 we parked at Lower Tamar Lake to walk south for a few miles on cleared towpath. A pleasant level walk in which we passed a proposed interpretive centre and crossed the old earth-embanked Bude Aqueduct. June 2015: I parked at Lower Lake and walked to Upper Lake to check out the facilities. Café seems to be open all year, as are the toilets. An outdoor centre is open from April to September. The walk around the Upper lake is about 3 miles. A path links Upper and Lower lakes. The map doesn't show a route all the way round Lower Lake but a path certainly sets off anti-clockwise though it may well peter out. July 2015: Jane had to visit the Remnant Shop in Bude so we decided to go on to walk round Upper Tamar Lake afterwards, stopping first at Churchtown for Jane to see St. Swithin's Church, Launcells. When we parked at Upper Lake, the wind was blowing hard and the temperature only 14° so first we stoked up on our pork pies and sandwiches. According to official sources the walk is either 2.00, 2.50 or 2.80 miles. In fact, and I believe my GPS, it is 3.10 miles. I wasn't surprised as at Sibleyback Lake, another of South West Lakes Trust sites, the official distance round the Lake is 2 miles, the actual distance is 3 miles. After our walk we had reasonably priced tea and cakes at the café. Lying roughly between Falmouth and Truro is a land of muddy tidal creeks. The Tresillian River is one such: just a couple of miles of tiny stream from source to the old main gates of Tregothnan, a couple more miles of tidal creek to Malpas, where it joins the Truro River, itself soon to join the River Fal. We walked along it in May 2007 as part of an outing to Truro's Boscawen Park, where our friend Carol Richards was involved with the Companion Dog Show. We parked in St. Clement, walked along the river to Tresillian and back, ate our sandwiches at St. Clement and then took an inland green lane up to Park Farm and down over the fields to Boscawen Park, on the Truro River on the south side of the city. A pleasant and varied walk of around 6 miles in all. If you would like to make a longer river walk of it, park in Truro, take the bus to Tresillian and follow the path along the Tresillian and Truro Rivers, through St. Clement and Malpas. The path to St. Clement is well made and level and stays close to the river, that on to Malpas is up and down through woodland; from Malpas to Truro you have to use quite a bit of road. Altogether the walk is around 5 miles. If you fancy a spot of refreshment along the way, you could do worse than try the Heron Inn at Malpas. Our neighbour Jim had told me about walking up the Valency Valley in his long-ago youth so, on a warm sunny day in June 2008, I decided to devise a round walk to take in Boscastle, The Valency Valley, St. Juliot Church and some coast path. I parked in Boscastle, wandered around taking photos, then walked up the valley beyond Newmills before continuing over fields to St. Juliot Church near Hannett. From there I took lane and field paths to Trebyla, Higher Beeny and the coast at Beeny cliff, following the coast path back into Boscastle. 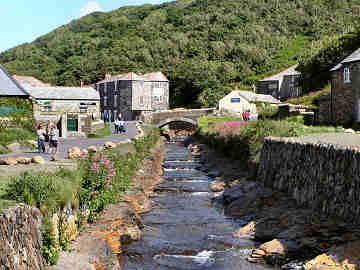 Looking at the little river in Boscastle, it is hard to imagine the devastating floods of August 2004. But further up-river you can see that it is by nature a spate river to which, it is said, trout and salmon are beginning to return. The valley is beautiful, steep and heavily wooded. 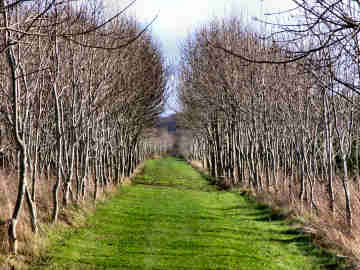 Much of the woodland is National Trust and paths lead up through it to Minster Church. A firm path leads all the way to Newmills where there are some attractive cottages tucked away. My walk had several connections with Thomas Hardy: it was at St. Juliot, where there is a lovely memorial window to him, that he met his first wife; and Beeny Cliff, where I joined the coast path, had special meaning for the couple. A delightful walk with only one tough part, the severe down-and-up at Pentargon on the coast.